Our Halloween Photography Tips are offered to help you get some ideas for great photos, methods for taking those photos and some ideas for using them in your scrapbook layouts. 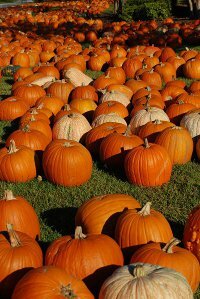 When I first think of taking photos for Halloween, my mind goes immediately to the Costumes that both Children and Adults wear, then my mind goes to the Pumpkin Patch photos and using those photos for background “papers” or accents on our scrapbook layouts. Then I remember the Jack-O-Lanterns and wonder about the best way to capture their mystery and the tricky lighting involved. And don’t forget to take photos of the Decorations both inside and out and the “Treats” given out on the night of the event or party. Try some of these Halloween Photography Tips for the upcoming Halloween events. Halloween Scrapbook Journaling and a link to some great "Horror" fonts to use for your Titles and Captions. Creative pumpkin photos - The photo up top is not bad if you want to remember where you bought your pumpkin. Try to get a little more creative when you take your photo, like the one on the right here that shows a trail going forward, breaks in the pumpkins and lots of different colors. 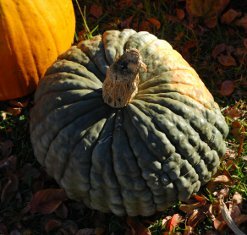 Particularly if you are going to pick your pumpkin from the field or even a harvest area, that’s always a start. 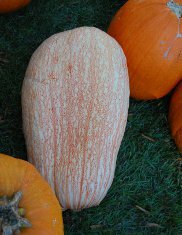 Don’t just go for the beautiful perfectly formed pumpkin, particularly if you are planning to carve it. 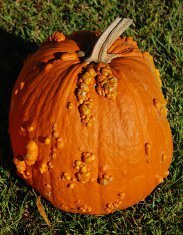 Scrapbook Advice Tip For making your Carved Pumpkins more Interesting: How about one that is not so perfect (or even ugly) and incorporate that imperfection into a great carved face. Our search this year turned up more than the normal pumpkins and a lot of what we just had to call ugly. 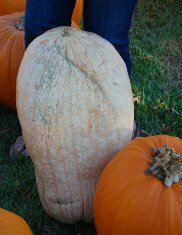 Take the kids and have they play a game of naming what the pumpkin looks like. Halloween Photography Tips: Take photos of the Pumpkins "Before, During and After" shots. The one on the left we thought of a ghost, and the one on the right either a horse face or a long scar for the beginning of the pumpkin carving. This little guy on the left we thought looked he had a Buster Brown Haircut under a Beret - French perhaps?. The one on the right was the first time we had seen that dark color. Wonder what it's called. 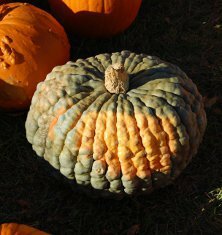 Here’s a link to give you some great ideas for photographing some pumpkins that are out of the ordinary. While some are a little extreme, use these to get some ideas to spruce up your Halloween Scrapbook Layouts at Unusual Pumpkin Photos. Carving your pumpkins into great Jack-O-Lanterns for your Halloween events has almost become a necessity and the right tools always make things easier. Nice little sets of patterns, saws and punches are now available to help you with getting so really complicated designs on those pumpkins. My set came from Martha Stewart about 2001 and it's still in good shape. Makeup and crazy costumes are always prominent at Halloween time, so focus on that. Try these Halloween Photography Tips: Get up close with the camera and fill the frame of the photo to get all the ghoulish details for your scrapbook. Hey, even try developing in Black and White to make things appear even more eerie. Halloween is a good place to start getting up close on the details of a photo op, here’s a link with some great examples that you can use for other photo sessions as well at Photographing Detail. Make your lighting work for you to make your photos interesting. I received an email from the New York Institute of Photography with this video spoof. Watch it to the end as it does have some good lighting tips for your Halloween Photography Tips. Another Halloween Photography Tip: Take some photos from a different perspective. Need a great spooky Halloween shot? 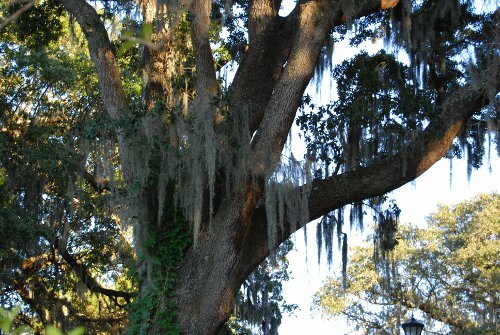 Here’s a photo of some grand oak trees with Spanish moss. I always thought these a little spooky as a child when riding down a southern highway on the way to my grandmothers house. 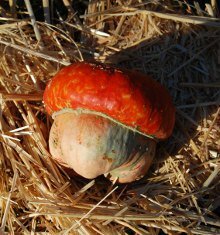 Taking some shots at dusk of these beauties can be a nice backdrop or accent for your Halloween photos and Scrapbook Layouts. This photo has been taken looking up into the trees which is how I always saw them as we rode down the highway. Here are some more photos tips on Perspective in Photographs. Get a photo of everyone as they arrive. This way you don’t miss any of the great costumes. Great idea for kids and adults alike. Halloween Photography Tips: If you have the camera set up on a Tripod it will make it hard for them to say No. This way the costumes, make-up and hair will be at their best. My experience is that parts of costumes some off for convenience or comfort sake. Particularly if there will be alcoholic beverages at the party, get those photos early. More Halloween Photography Tips: If you are planning lots of photos and particularly if you want to be in the group photos, think about using a tripod and timer. Practice this before hand so your guests don’t have to go through the learning curve with you. A tripod is a good idea for individual shots as well because you can set it up beforehand with an appropriate background and lighting and once that is done, it is easier to convince folks to let you photograph them. Group Halloween Photography Tips: Halloween often means groups of people and taking photos of an entire group is not easy. Think about your group photos ahead of time. Where are your going to have them stand? Think about the background - not in front of a window so you get flash back in your photo. Is the area large enough to accommodate everyone. Group shots are difficult at best. Just to make sure that everyone is available for the group photo, let everyone know there will be a group photo taken and do it early in at the event - or shortly after the last guest arrives so everyone is in the photo. Take lots of shots and tell your group that you will take multiple shots. Do you have a continuous mode feature on your camera? Use it as someone will always be blinking, and this will allow you plenty of shots to go through to get the best. When getting your guests in place, tell them which direction you want them to look so they are not all scattered. Get someone to help you with positioning folks, the tallest in the back with the shortest in the front and on the sides. Here’s a link to more great professional detail about Taking Group Photos. I was researching the other day and found some neat tricks to make some ghostly images and double exposures appear in your photos. Practice this before your party to get the process down before you put your guests through your learning curve. If you are going to try this trick with your guests, demonstrate it so they know what you are trying to do. I think this is a great idea. Check out how to make those Ghostly Images. to purchase Tammy's beautiful and unique layouts and products. Have a great time planning and taking your Halloween photos. I hope these Halloween Photography Tips have helped you gain some new ideas for great photos and the onto better scrapbooking layouts. Check out their Daily Specials! at "Deal of the Day"